Hot Springs, Arkansas – National Park College (NPC) Board of Trustees swore in three women for renewed terms Wednesday. County Clerk Sarah Smith conducted the ceremony briefly before the Board’s annual and regular monthly meetings January 23. Beverly Joe, Joyce Craft, and Gail Ezelle were each re-elected to their positions on the Board in November. “NPC is more than a community college to me, it is an extension of my family. Not only did my first two years of college begin at NPC, then Garland County Community College, but I also taught as adjunct faculty for six years. As my family grew, my daughters also completed their first two years of college at NPC. Two of us have completed our MBAs and my youngest is currently completing her bachelor’s degree at UALR,” said Joe. Craft was first elected to the Board in 2001. She served her entire career in education at Hot Springs School District, including eight years as superintendent. She wanted to serve on the Board to give back to the community and share her years of experience in education. “It’s rewarding to be a part of an institution that focuses on student success,” said Craft. Ezelle was first elected to the Board in 1983. She was interested in serving on the Board because of her long-time involvement in education which began when she worked as a librarian while her children were in school. She participated in the Arkansas State Parent Teacher Association and served four years as an educational lobbyist. Ezelle said education has always been a priority in her family, a legacy that began with her grandmother. “She went to college in Texas and she firmly believed in her family being educated,” said Ezelle. Nine of Ezelle’s children and grandchildren have attended NPC and two of them have gone on to earn a doctorate degree. “Education is so important and as a result, I think because of my interest, they managed to care about education as much as me,” she said. Board chair, Forrest Spicher said having all three of the Board’s female members re-elected at the same time was inspiring to watch. “These three ladies come from very different backgrounds and each brings a unique perspective to our Board. I am thankful for their willingness to serve the community in this role and I am proud to work with each of them,” said Spicher. 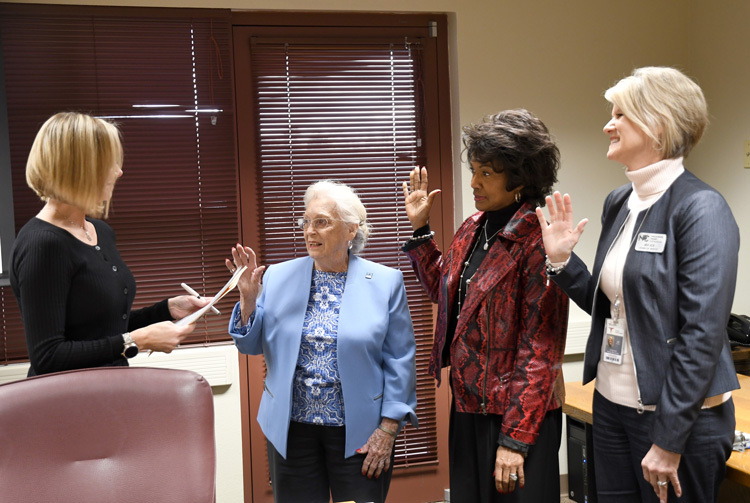 Pictured is County Clerk, Sarah Smith swearing in board members Gail Ezelle, Joyce Craft and Beverly Joe.